Oracle Cloud at Customer Enables Next-Gen Computing | Constellation Research Inc. 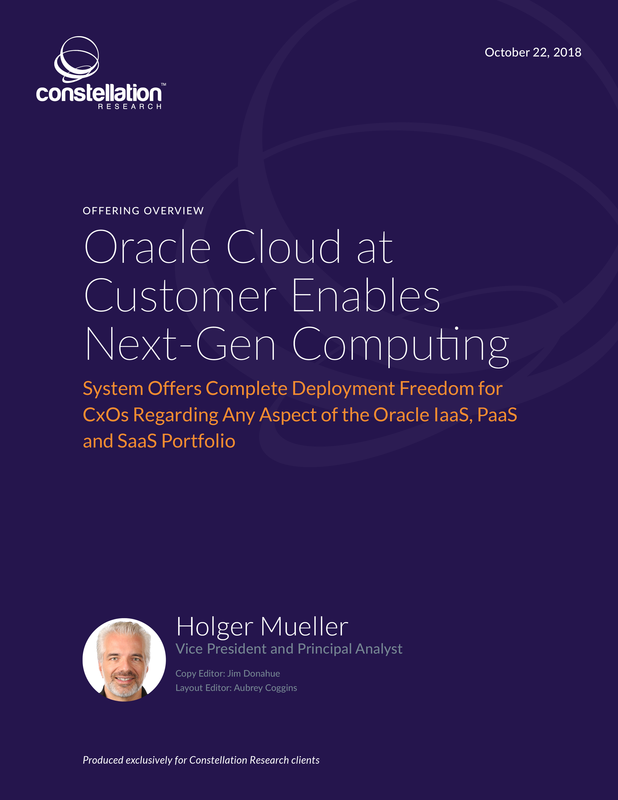 This report provides an overview of the Oracle Cloud at Customer portfolio (this includes Oracle Exadata Cloud at Customer, Oracle Big Data Cloud at Customer, Oracle SaaS at Customer and Oracle Cloud at Customer) and analyzes its capabilities to satisfy the need of enterprises for a next-generation computing platform. A next-generation computing platform allows enterprises to deploy workloads across the premises and the public cloud. For enterprises running their next-generation applications on a next-generation computing platform, Oracle Cloud at Customer does very well because of Oracle’s vision of the “chip-to-click” integrated technology stack (i.e., from the CPU silicon, across all OSI layers and all the way to the end-user mouse click). With Oracle using the same technology stack and machines both in its cloud and on-premises, it has the highest degree of identicality across these offerings from all vendors that are part of Constellation Research’s Market Overview on next-generation computing platforms. The others are Amazon Web Services’ offline portfolio, Google GKE On-Prem, IBM Cloud Private and Microsoft Azure Stack.